Yangon, 16 June 2015 – UN Habitat Myanmar partners with the international engineering firm Arcadis, under the Arcadis Shelter Programme. 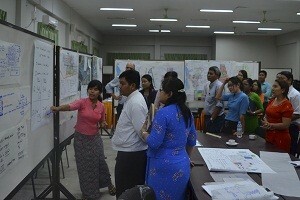 A team of seven visiting Arcadis experts joined UN Habitat Head Office staff on a two-week mission to deliver urban planning training and undertake socioeconomic analysis of some major Myanmar cities. The four-man urban planning team, led by Mr. Rogier VanDenBerg from UN Habitat’s Urban Planning & Design LAB, delivered an applied training on the implementation of Urban Planning Guidelines in Nay Pyi Taw from 2-4 June. The Planning Guidelines were developed by the Planning and Design Lab in Nairobi following a two week mission to Myanmar last October. 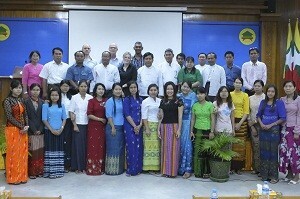 Participants in the training session included national urban planning officers from the Department of Urban and Housing Development as well as planners from Mandalay, Yangon, and Nay Pyi Taw municipal governments. Over three days the participants learnt how to develop economically, socially, and environmentally sustainable cities that will allow for future urban growth and evolution. The draft Guidelines were presented to Deputy Minister H.E Dr. Win Myint by Mr. Van Den Berg and UN Habitat Country Manager Mr. Bijay Karmacharya, with the final version to be revised based on the experiences in the training. A second team conducted detailed socioeconomic assessments in Mandalay and Mawlamyine, two of Myanmar’s largest cities with high levels of future growth predicted. The demographic assessment drew upon the 2014 Census Results in release d in May 2015, and expert analysis of the urban conditions by the Arcadis team. The demographic profiles set out three different growth scenarios for each of the cities and identify strategies for sustainable development. Directed and strategic economic growth will be of crucial importance for Myanmar in the future as it deals with rapid urbanisation. Myanmar is at a critical point in its history as one of the least urbanised countries, in the most urbanised region of the world. Today approximately one third of the country’s population lives in cities, and this is expected to grow considerably in the near future. Well-managed urbanisation can be the catalyst and driver for economic growth, while poorly managed growth can create the kinds of urban problems seen in megacities around the world. To promote sustainable urbanisation, UN Habitat is supporting the Government of Myanmar in its development of a National Housing Policy, National Urban Development Strategy, and a major expansion of urban planning capacity. ARCADIS and UN-Habita t, the United Nations Programme for Human Settlements set up the Shelter Program in 2010. ARCADIS provides pro bono expertise for UN-Habitat. Over fifty missions, trainings and other Shelter activities have been organized in Asia, Africa and Middle America. Over 120 ARCADIS Experts from a range of disciplines have been actively engaged in the program by sharing their knowledge, expertise and providing capacity-building support skills to help bring the UN-Habitat mission forward. This combination of expertise from a wide variety of backgrounds is aimed at improving living conditions in cities around the world, especially for the urban poor.